It’s time for a pretty unique anime that I had never really heard of until I began watching it. 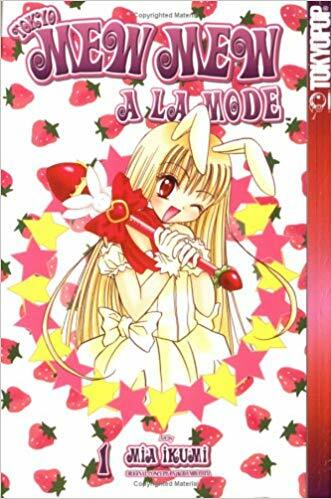 The Magical girl genre has always been pretty good, at least for the titles that I’ve seen. Madoka Magica is one of the greatest anime ever and Sailor Moon/Cardcaptor Sakura were also pretty fun back in the day. Princess Tutu is the first one I’ve seen in a while and it’s pretty solid. There is always an air of mystery with the series and not everything is as it seems. The first arc starts off with a Duck being turned into a human. Duck had always wanted to be a human so she could cheer up Mytho (Pronounced Muto) since the guy always seemed sad. This was her big chance and she is now enrolled in a dance school. She quickly makes two friends once she’s there. Duck then discovers that Mytho is actually missing all the pieces of his heart and it’s up to her to find them. 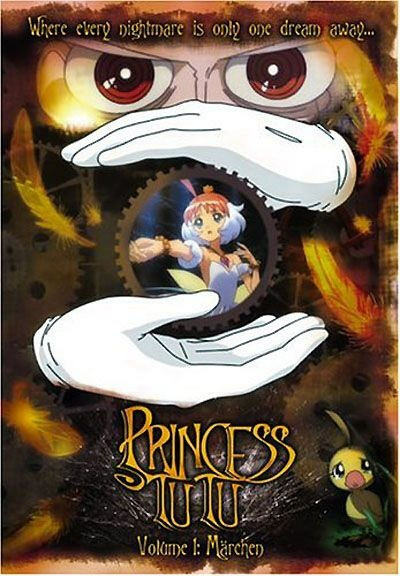 Duck can transform into the hero known as Princess Tutu in order to complete this task, but she will have to deal with many objects that have gained sentience. Whether it be solving puzzles or giving them a pep talk, Tutu must stand strong. Of course, it’s easy enough when there is no big antagonist, but that doesn’t last for long. The big villain behind the scenes is Drosselmeyer. He’s an old story writer who died and went to the spirit realm so he could become all powerful. Whatever he writes becomes reality so he is a dangerous opponent. We also have the evil Princess Kraehe who doesn’t want Mytho to regain his heart pieces and stands in Tutu’s way. Mytho’s best friend Fakir has the same objective although he is at odds with Kraehe. Tutu will have to overpower all of them to help Mytho out. Arc 2 continues the plotline of gathering the heart pieces, but the game has changed quite a bit. For starters, Kraehe gets a bigger presence in the story as we find out that she is working for the Raven King. He wants Mytho to get his heart back to he can take over his body and destroy the world. Drosselmeyer is still around as well and Tutu has doubts on if she can get all of the heart pieces back and even if it’s the right thing to do at this point. Throughout the show, the town is very cloudy. It’s still light outside, but this effect makes everything a little more mysterious than it would b otherwise. You always wonder if something sinister is about to happen. It’s a pretty nice atmosphere effect to make scenes a little more tense even when they’re happy moments. It helps you feel like someone may be in control in the background. The show even hints at the final plot twist early on as Duck will wake up one morning to randomly find that they have an animal for a classmate or a cat for a teacher. Humans randomly change, but everyone acts as if they’ve always been there. The whole town can be strangely isolated at times with people only being around when it’s inconvenient. Yet, the humans still appear enough to cement their roles in the town. Very mysterious. Princess Tutu is first and foremost a dancing show. Tutu beats all of her opponents by convincing them to dance with her and the bond they develop as a result gets the villain to turn good. Most of the villains aren’t evil after all, they just went down the wrong path to ruin. It’s handled pretty well and I wouldn’t call it cheesy. It’s outlandish, but as none of the villains were super evil it was pretty believable. A few of them did try attempted murder so the water’s a little murky but it’s a nice gimmick. The soundtrack may not be the most exciting as a result, but you’ll get to hear a lot of classic songs. Swan Lake, Nutcracker, and other iconic songs from ballet. It’s a very soft soundtrack that lets you focus on the dancing. I think a quick electronic/fast paced rock song would have fit in well enough, but I suppose I can see why they didn’t go that route. The animation is pretty good. It’s nothing amazing, but the show has aged well for its time. The character designs are on point and the action scenes are good when they appear. At first I wasn’t expecting too many fights but about midway through Arc 1 we slowly started to get more and more of them which was certainly a good thing. I love a good fight scene even if the villains always seem to have the edge in raw power. That’s why you also need some dancing to slow them down. Duck is our main heroine and she’s a fun character. She can run low on confidence at times, but always does her best to do the right thing. The fact that she can transform from human to duck and vice versa is certainly very useful. It’s also interesting how she gets a different personality as Tutu, but still does seem to be in control and keeps her memories. I suppose it’s just a really big confidence boost inside of the power up that happens automatically. Either way, I definitely had no qualms with Duck. She made the hard calls and never deserted her friends. Mytho is an interesting case since he was missing his heart for quite a while. Without it, he let everyone push him around for a while. He had no emotions so he was fine with betraying everybody and just doing what he wanted. It was definitely hard to sympathize with the guy. In arc 2 he made for a good villain as he turned evil thanks to the Raven’s blood. I suppose we can’t blame him here either, but it is tempting since it shows a lack of willpower. It was probably his best string of appearances. We finally see the real Mytho in the final episode so that’s something. He finally becomes the hero he has always wanted to be. I guess Mytho was an okay hero, but a good villain. All in all that makes him a good character, but he serves as more of a plot device for the cast to fight over than anything else. Fakir starts off as a rather antagonistic person who slaps Mytho and threatens Duck’s life. We eventually learn that he only became a villain to keep Mytho safe. See, it goes back to how the characters are all puppets who are being manipulated by Drosselmeyer. The whole town is essentially one giant page and the author has full control. However, Drosselmeyer’s plan can only continue if Mytho gets his heart back so Fakir has decided to prevent this from happening. He isn’t able to stop Duck though and that’s why he goes down the dark path. Eventually he comes around though and after realizing that it is futile to try and stop Tutu, he does his best to protect Mytho. By Arc 2 he is finally a full fledged hero who helps in saving the day. It’s definitely hard to forget how over the top he was at the start, but I suppose all of the characters either started out evil or turned evil at some point. Duck is the only one who was a hero throughout. 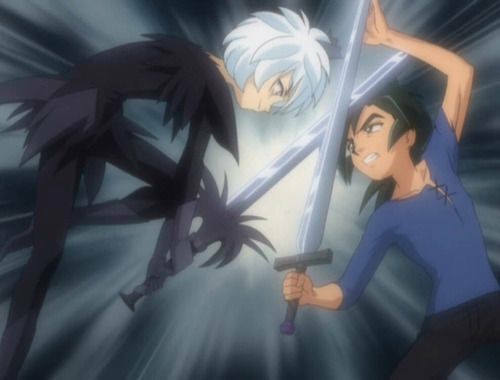 Fakir also gave us some fun action scenes which was neat since he had a sword. Rue is the best character in the show and one of the main supporting characters. 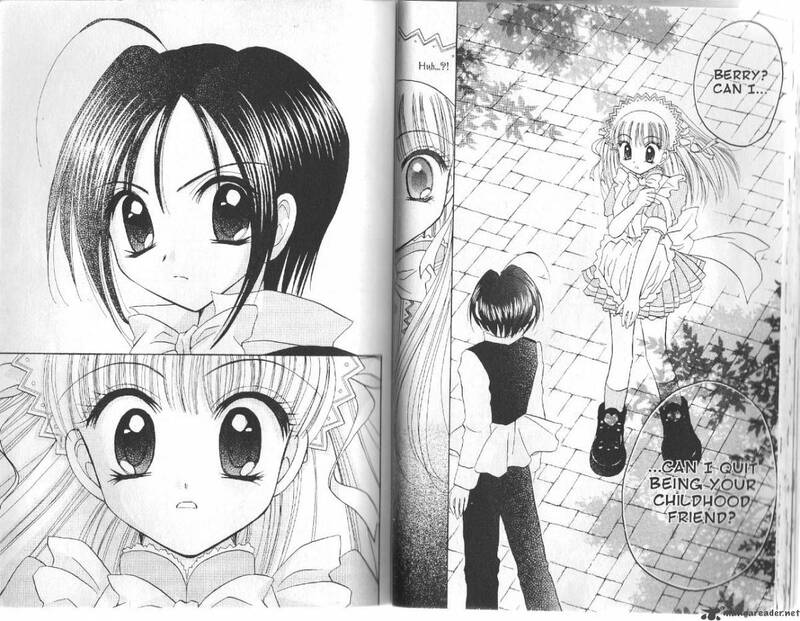 She agreed with Fakir that Mytho shouldn’t get his heart back but didn’t change her mind quite as quickly as he did. She wants Mytho to stay with her, but if he regains his memories then he will likely ditch her right away. Her character’s destiny from the story is to be despised by all and then to die. Again, it makes for an interesting dynamic since they all know that they’re merely puppets in a story. Rue shows some glimpses of possibly returning to the good side, but then her father the Raven King shows up and makes that impossible. Rue still does her best to spare some humans that she comes across and ultimately doesn’t want to be a villain, but has a hard time getting out of her predicament. Arc 2 as a whole was pretty tough on her, but at least she got a happy ending. Rue made for a very good rival to Tutu and the show basically said that she is even stronger. Rue has quite a lot of special abilities at her disposal aside from dancing. Tutu got some plant abilities to counter them, but I’d still give Rue the edge. Raven King is the big villain in Arc 2, but 90% of his screen time is just him on the throne. He only throws one body slam near the end or attempts too, but that’s the only action that he gets. He is pretty huge and technically powerful, but he just isn’t fast enough to hit the heroes. Maybe he shot some energy blasts, but I can’t recall if that was really him or I’m just mixing up an effect. Either way, he had a nice voice, but was also very repetitive. His role was to keep reminding Rue that she was doomed to be forever alone. He’s not a very nice guy to say the least. Drosselmeyer is the actual main villain, but I never liked him. He’s not nearly as intimidating as the other antagonists. He panics quite a bit and while he talks a good game, there’s nothing interesting about him. He’s pretty OP since he can do anything from the mirror world but he rarely goes to the human world since he is supposed to be dead. The heroes can’t really do anything to him either so he’s just around. I suppose it can be entertaining to see him running back and forth all the time. Edel was a pretty shady character from the start and I had a feeling that you couldn’t trust her. I never liked the character since she always just spoke in riddles that went around and around. Maybe that could have worked, but it didn’t this time. Everytime Duck would ask something Edel would just dodge the question. Uzura was slightly better as she was a kid version of Edel who was always yelling. She also didn’t add much, but at least the yelling and drum playing she always did must have been real annoying in real life so I like thinking about how the villain has to put up with that. Autor is a character who shows up near the end of the series and he was pretty cool. He actually knows the truth behind the town and is working to get past it. Unfortunately, he is not the chosen one so there isn’t much he can do, but he acts as a mentor to Fakir. He even has a pretty cool moment where he takes down the guys with the axes. They certainly went off the deep end and had some of the worst plans possible so I was glad Autor won. I was expecting him to be a villain for a while so it was cool to see him as more of a rival. He was one of the more low key great characters in the show. Pike and Lillie were Duck’s two friends from school. I didn’t care for Lillie as she always pretended to be Duck’s friend but would then backstab her constantly and try to get her into trouble. She would try to chip away at Duck’s self esteem and was just mean the whole time. We never even got a character moment to explain that so it was just odd. At least Pike was always trying to be helpful and supported Duck in what she did. Then we also have Mr. Cat who is the dance instructor. He’s pretty annoying and is constantly asking people to marry him and sweating bullets when they refuse. The gag shows up in every episode that he is in and got old the minute it happened. He’s definitely the worst character in the show. The main cast was really good or at least very interesting the whole time while the supporting cast was quite a bit weaker. Still, there were always enough good characters to keep the ball rolling. The writing was pretty good throughout. Everyone moved with purpose and they all had their own motivations. The show didn’t have any real fanservice as even the transformation scenes and the tricky Duck turning into a human moments were handled really well. It’s a pretty safe anime that I could recommend to anyone. If I have any problems with the show, it’s that I’m not a big fan of some aspects of the final twist. I’m fine with them all essentially being stuck inside a fake town that is all a story. I think it was maybe a little too far when they were all literally puppets being forced to move around. Even if Fakir is now the one with the controls, it takes away from their free will. Based on Fakir’s struggle to write a happy ending, they do have some limits and it’s all based on will power, but they still do control an awful lot. The characters really have to wonder about everything they do now and if it is really what they wanted to do. I think just take away the strings and have it so the authors can write new characters and events into the mix, but they can’t actually control the characters. That would work a little better. I ultimately don’t get why Drosselmeyer didn’t just write a new ending after the bookmen stole it, but I’ll assume that he just didn’t have enough willpower left. I suppose that the romance was handled pretty well. Mytho had a tough time making up his mind and the first choice couldn’t work out for some characters, but it’s just another tough call to make. Duck made the hero call and just did what was best for the team so that was definitely nice of her. Anyway, being a duck isn’t so bad. It sounds pretty fun if you ask me although I would definitely stay in human form for the most part. It’s still the best way to play. Finally, a neat visual effect was the little clocks that would zoom in on various characters whenever Drosselmeyer checked in on them. Since he was essentially the grand author in charge of this production he needed to keep an eye on them somehow right? I would have liked to have seen more of how he used those to affect the real world though. I guess we couldn’t see too much or he’d truly be OP but there must be some limits to it. How is he even this strong? He brings up the most questions in the series for sure and I suppose we just have to roll with them. Overall, Princess Tutu is a pretty fun show that I’d definitely recommend checking out. I’d say that it’s probably a little closer to Madoka than Sailor Moon in how serious it is, but is pretty well placed in the middle. It has a lot of Sailor Moon’s happy scenes and monster of the week moments at first, but also has the increased stakes and mystery of Madoka. There is also quite a bit of drama since Duck wants to bring Rue back to the side of the heroes, but this proves to be a really difficult task. It’s also hard to say which arc was actually better. Arc 2 got off to a faster start since the characters were already introduced but Arc 1 did have the better climax. I’ll probably say that Arc 2 takes the narrow win here. It’s just a very balanced show that did a good job of playing to its strengths. All right, it’s time to look at the movie that followed the TV show for Madoka Magica. I’m assuming that you have already seen the TV show so I will be mentioning the ending since we have to connect how it leads into the film and what happened. While the movie isn’t quite as amazing as the TV show, it’s still great and gives us some epic fight scenes while still dealing with deep themes. The ending is not as satisfying as the TV show’s end, but it is fairly original. As you remember from the TV show, Madoka used her unlimited magical powers to recreate reality and add another rule to the books. The Law of Cycles was created and when magical girls are filled with despair, Madoka takes them to the afterlife so that no witches are born. Sayaka was taken so the rest of the magical girls were on their own and Homura was the only one who was allowed to keep her memories of Madoka. The witches were gone, but in their place came a new evil, the Wraiths. That should have been the end of everything, but Homura wakes up one day in a world that seems to have forgotten this. Witches are still gone, but so are Wraiths. Nightmares have taken up their place and Sayaka, as well as Madoka are both alive once again. Kyubey acts like he cannot talk anymore and Mami is friends with the witch who ate her in the show. This world seems messed up and Homura has to find a way to make everything turn back to how it was. This labyrinth cannot hold her forever! There’s a lot to say here so where to start right? Let’s go into the technical parts of the film first. The soundtrack is not quite as good as the TV show’s since we’re missing the incredible end theme that was present over there. Nonetheless, it’s still quite good and the songs definitely give the film the feeling that the heroes are always in danger. You can tell that the very city is sinister the entire time and it helps to create a good atmosphere for the viewers. Animation wise, the movie likes to be very abstract so it doesn’t show off the animation very often. For the most part, you won’t notice much of a difference between the show and the movie. 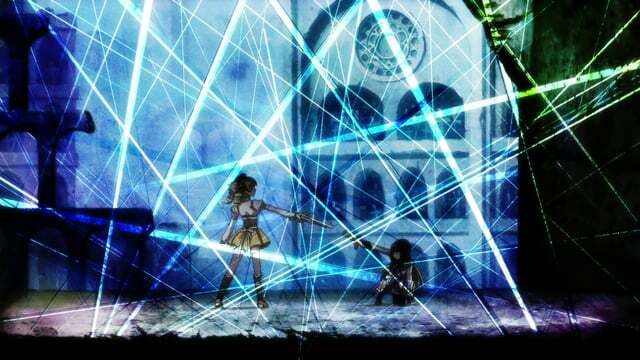 That being said, there is one scene where the film uses its animation seriously when Mami fights with Homura. That was certainly the highlight of the film and the action scene is quite good and we get to see why you have to fight very carefully when time control is being used. The two heroines shoot hundreds of bullets at each other so when time moves again, it gets very chaotic. These two are also likely the strongest of the magical girls so seeing them fight was epic. The fight wasn’t very short either so we really got to see what they could do. Obviously, Homura could win in an instant with time control so Mami intelligently placed a thread on Homura so that Mami wouldn’t be stuck in time. That move’s what makes the fight so even. 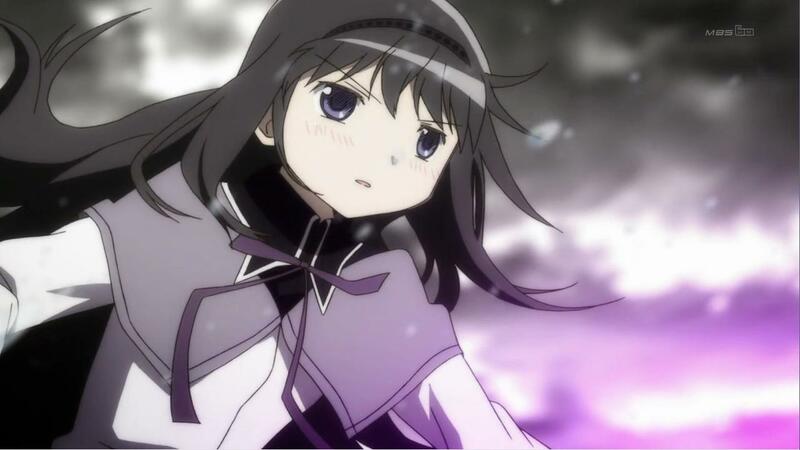 Homura was confident that she could win the fight, but she was also trying not to destroy her friend in the process. Both of them were holding back and due to the circumstances, I’m fine with Homura not winning. With her time mastery, she is virtually invincible, but take that away and Mami should in fact have the edge thanks to her incredible offensive capabilities. I liked her as a character much more here than in the show. Of course, Mami didn’t crack here like she did in the other version and even tried to stop Homura from shooting herself. 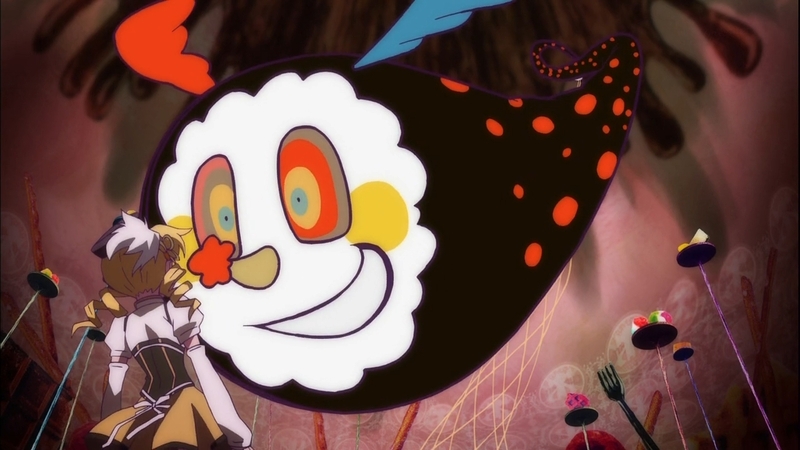 I’m actually glad that Mami defended Bebe since they were friends for quite a while so she shouldn’t betray the creature just for a transfer student. Protecting one’s friends is what a magical girl does after all so while I was rooting for Homura to win, Mami made the right decision in fighting at that point. Kyoko’s still ahead of the other Magical Girls for me (Aside from Homura) and she gets a decently good role here. She’s the first to be told that the world isn’t real and she backs Homura up the whole time. By the end of the film, her role quickly begins to grow smaller, but she is a little outmatched against the heavy hitters. She has been surpassed by all of the other magical girls, but she still tries hard and is a nice friend to have. Madoka is an interesting case here because some twists make her look a little bad and possibly weak considering that she’s all powerful. All right gang, spoilers for the film are coming up now so skip the rest of the paragraphs to avoid them until the final one. I do recommend just checking out the film before reading the review so you can have your own thoughts on what just happened and your views on Homura’s decisions. Before going into the characters, I should really talk about the timeline here so that it all makes sense. 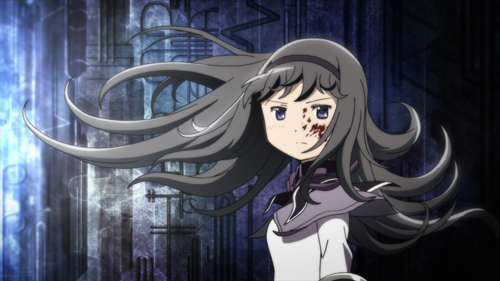 As you remember, Homura was still fighting Wraiths in the after credits scene of the show. She was not fighting to save the world, but she did it because that’s what Madoka would have wanted. Well, at some point, the Incubators found her. It’s hinted that it may have been willingly, but even if it wasn’t, the Incubators trapped her soul in a prism so that nothing could interfere with it. This allowed Homura’s despair to turn her soul into a witch since the Law of Cycles cannot breach the barrier that the Incubators had put around her soul. If you think about it for a minute, this means that the Incubators were able to defy one of the fundamental laws of the universe. It’s been hinted that these cosmic beings can do just about anything, but their limits are very vague so it’s still hard to quantify. They cannot end entropy on their own after all and offensively, they don’t seem to have a lot of power, but maybe it’s all just an act. They have no emotions so they may not even care what happens to their physical selves. Back to the timeline though, as a witch, Homura recreated the city where she used to fight with the other heroines. Her soul lured in Mami, Kyoko, Sayaka’s friend, and the violin player among others. It was impossible for anyone to free Homura from the outside and once the heroes were tricked into entering her labyrinth, they could not get out again and they also forgot their memories rather quickly. It was like the old days of entering a witch’s labyrinth, but Homura is much stronger than an ordinary opponent. Homura even erased her own memories so that she could have fun with her friends. It was created to be a perfect world after all so she would have infinite happiness here. In the end, her illusion was too good and Homura sought out the truth. There were 3 people in her labyrnth who didn’t belong. Madoka realized that her friend was in trouble so she assumed a physical form once more and entered the labyrnth. Realizing that there was a lot of danger here, she gave her powers to a creature known as Bebe and gave Sayaka her memories. They are essentially Madoka’s bodyguards and have ascended with her to the next plane of existence. Naturally, this means that they both got a big power boost, which explains why Sayaka was so quick in her brief scuffle with Homura. Madoka forgot her memories, but the two bodyguards didn’t lose theirs. The heroes were able to defeat Homura’s witch form and made it back to the real world. Homura’s despair had still covered her soul so Madoka reached out to take her to the afterlife, but Homura had actually been tainted more than the heroes had realized and literally ripped out the human Madoka from her godself and altered the laws of reality once more. Homura essentially became evil to counter Madoka being good. If Madoka became a god then Homura was essentially a devil. 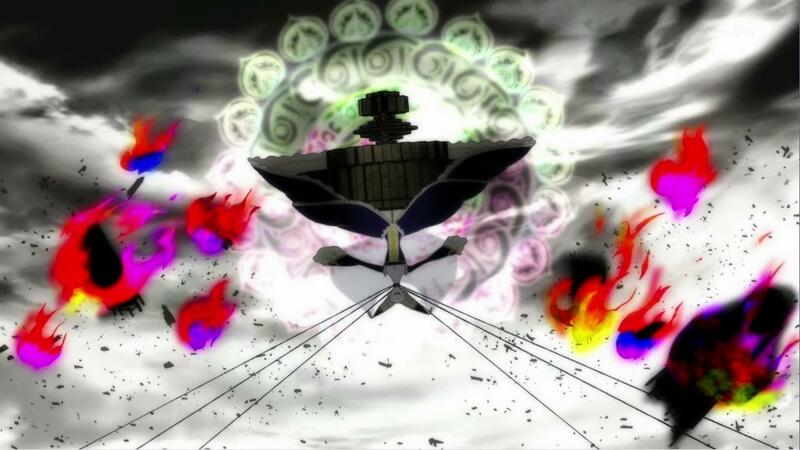 (The word demon is used in the film) She decided to recreate the universe and now Homura is the ruler of it all. Madoka still has her limitless power and could overthrow Homura in time, but she has lost her memories again. The film ends with Homura stating that the heroes will remember at some point and they will try to fight her. With Homura’s abilities are great as they are now, it’s hard to see how they can pose a challenge. Only Madoka can hope to defeat Homura and she will need to get her memories back first to do that. Sayaka seems to recall some parts of what happened even after Homura erased her memories so she will likely be the key if the film ever gets a sequel. A sequel really isn’t needed, but I would like one. We know that Homura will either keep them under her power for eternity or they will eventually defeat her, but what will the heroes do then? Madoka can recreate the universe a third time or bring things back to the way they were. If Madoka does the latter, the Earth is not in a good state. From what we saw of the present, there aren’t many inhabitants anymore and the whole world is like a large desert. It’s easy to see how the heroes succumb to despair so quickly and it’s what ended up breaking Homura. If Madoka ends up just recreating things from scratch, it will be like Terminator where the cycle will never end, but at least then the heroes get to have more adventures. By the end, I thought that the film did a pretty great job of explaining everything. Now, the whole film works well into a linear timeline and the show also made a good amount of sense and it’ll probably feel even more grim when you watch it since you know that Homura ultimately ends up turning evil and wasted Madoka’s wish. 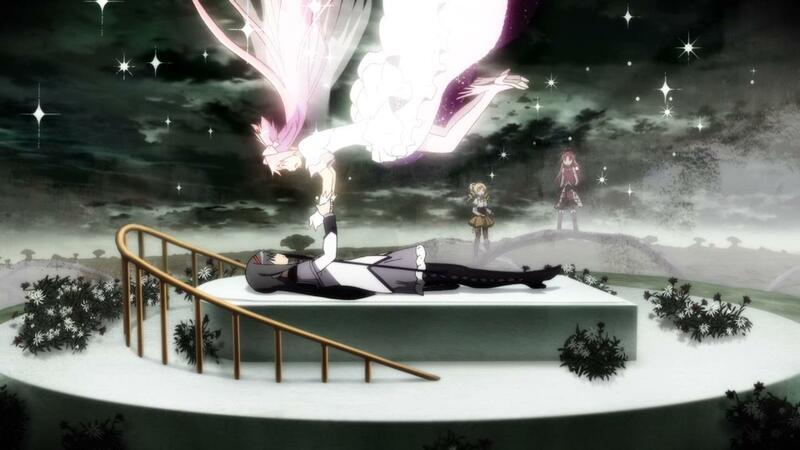 The one really iffy part here is how Homura was able to grab infinite Madoka and pull her down from the heavens. She is now a demon who is evil incarnate, but that should not be enough power to grab Madoka even if the heroine was surprised. As I mentioned earlier, the ending is very original because evil actually won in the end. There was no happy ending to be found and the powers of love and friendship lost to a twisted version of those that Homura used. Whether you decide that good wins in the end or not, the film ends with evil having the clear upper hand and it’s really 50/50 as to what side will ultimately claim victory this time. 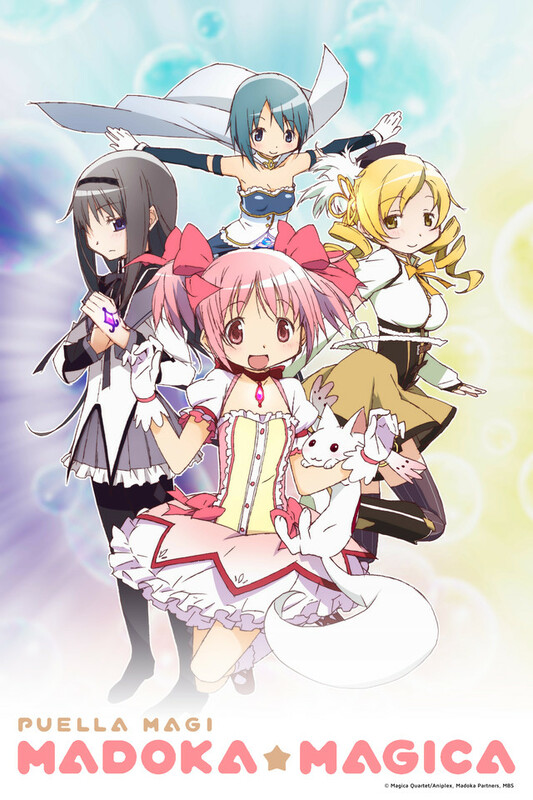 Madoka can’t count on any of the other characters to help her aside from Sayaka so it will be tough. So, I still like Madoka a lot like in the show, but the one thing that makes her look a little bad is that she lost her memories when she went into the labyrnth. 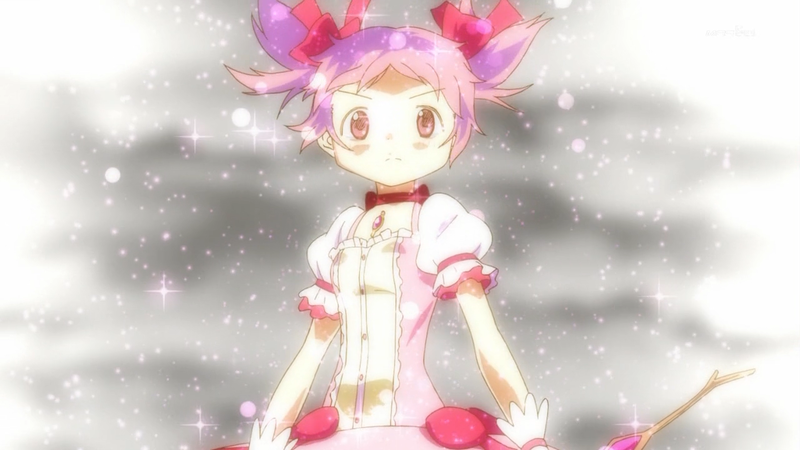 It’s okay for the mortals to lose theirs, but Madoka is literally a concept who is above everything in the universe. She should have had enough power to have stopped Homura without putting in any effort. I’m glad that she stepped in unlike most cosmic deities, but it did make her look a little weak. It’s a good thing that she has two bodyguards by her side. This will likely give One Above All fans from Marvel some breathing room for debates since Madoka clearly has some weaknesses now. Personality wise, she’s definitely still a lot of fun though. Even without infinite power, she’s a good fighter. Sayaka is no longer mortal and she can now use her witch form to fight, which makes for a pretty good power up. She’s a solid character as you would expect and still backs Madoka up whenever they get into a tough situation. She has moved on from the violin player, which is great character development if you ask me. That guy certainly wasn’t adding to the story so I’m cool with him being gone from the main focus. The power up was also very good for Sayaka and I’m glad that she was able to keep her memories and personality since she had been dead. Kyubey is still as sly and crafty as ever and his plan here is really ambitious as he wants to control Madoka and her unlimited power. I don’t think that the plan should be very plausible, but I suppose that if Madoka had destroyed Homura while inside of the gem, then they would be able to steal her power, but it’s all assuming that Madoka couldn’t break out of the barrier and with unlimited power, I feel like she should be able to easily bust free. Those cosmic beings definitely have some good tech to be able to stop her. His chase scene with Homura was a lot of fun and it was like a high budget version of what happened in the first episode of the show. It’s impressive that he was able to last so long when Homura was really out to get him. It’s too bad that Homura is a total villain now. I also don’t fully understand why Homura made her final decision. If she had gone with Madoka to the afterlife, they would have been together forever like with Sayaka, who is always by Madoka’s side now. That would surely be better than trapping her in the new Earth while repressing her memories. I don’t fully understand Homura’s rationale for doing this, but since she has become a demon, she may just prefer it this way. If you ignore the moral implications for a second, Homura’s world is actually a lot better than Madoka’s. Everyone is essentially back to life and the world is how it was before everything was destroyed. The Kyubey race can no longer hurt them and while villains are still around, the heroes can defeat them with ease. Everyone gets to live and Madoka doesn’t have to be a cosmic entity who can’t hang out with her friends anymore. On the surface, it’s a perfect world. The problem is that Homura had to alter everyone’s memories so they wouldn’t object to it. Madoka simply erased her existence from everyone’s minds, which is different from Homura deliberately altering her friends so they wouldn’t try to stop her. If she had willingly gotten everyone to agree to her plan, then it would be completely okay. She just went about it the wrong way. For her, it’s likely a deal that is worth it since she gets to hang out with Madoka again. (I don’t get why Madoka had to be the transfer student this time though. Wouldn’t that change so many things that Homura should be a little concerned?) As always, Homura is just doing things for Madoka. Now, the heroine won’t have to be a cosmic deity who is forever alone. That being said, Homura is also looking out for herself this time and now she gets to have the life that she always wanted. I feel like I would sympathize with her wish a little more if she didn’t act so creepy/evil in the final scenes. For some characters, their bond is stronger than their desire for justice so protecting Madoka at any costs is something that I wouldn’t necessarily disagree with especially with how well the world turned out to be. Seriously, if Homura hadn’t been so over the top at the end, I wouldn’t have minded the ending nearly as much. Homura’s still a villain, but she’s a very likable villain at this point. Who knew that one character would end up being the best hero and the best villain in this franchise! When you think about it, friendship is still the main theme here. The main difference with this compared to other shows is that the powers of friendship actually hurt the main characters. Madoka sees that Homura is in trouble and decided to enter the labyrinth in a human form, but it was her undoing. Homura’s friendship for Madoka turned into something sinister and led her into the road of evil. Everyone believed in the power of friendship, it just turned out badly for the characters. Naturally, the series got even higher in the tier lists here thanks to Homura’s big power boost. 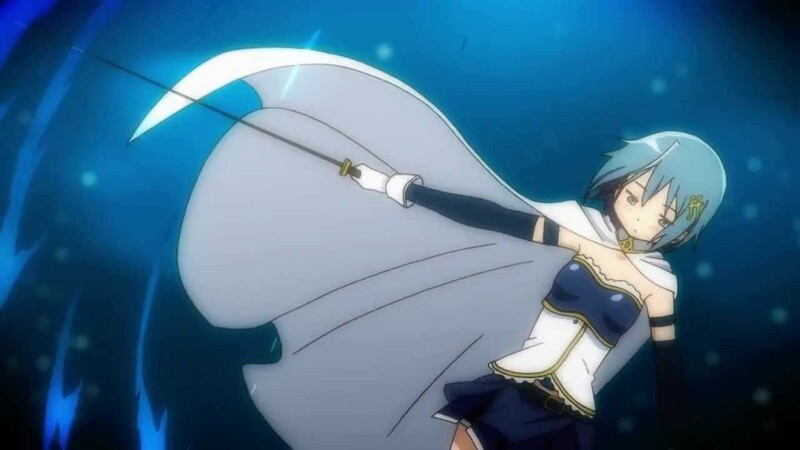 Not to mention that Sayaka was also a lot stronger as well. This series really does blow the rest of the magical girl series away with how strong the heroes are. Mami could likely take down the group of sailor scouts on her own if you ask me. The Wraiths and Nightmares weren’t particularly impressive, but they have a lot of minions, which will help to distract the opponents. In a possible sequel, I’m sure that the characters would get even stronger! As with the show, we get a lot of random abstract scenes during the show, which are always intriguing. 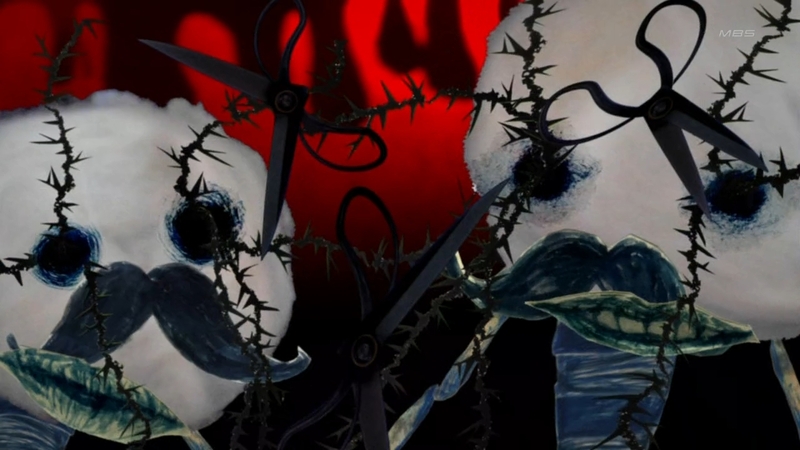 The cotton balls with mustaches are still around and we get to see them fight the new villains at one point. The magical girls also have a weird transformation scene for each of them, which are all odd and likely have deeper meanings, but it’s good to just take them at face value sometimes. One really entertaining scene was the cake song where the heroes took on the nightmare. It was fairly creepy, funny, and entertaining at the same time. Talk about high stakes! With the battle between good and evil, the film reminds you that it can be very easy to cross that bridge. Madoka allowed her friend to pull her back from her ascension and Homura turned evil. One must be strong and know when to hold steady so that you do not end up being led astray. Saving someone else is always a top priority and you must make every endeavor to complete that mission, but you must also not allow yourself to become weak enough that you are dragged to the dark side yourself. It’s something that Madoka probably wishes that she had known earlier. 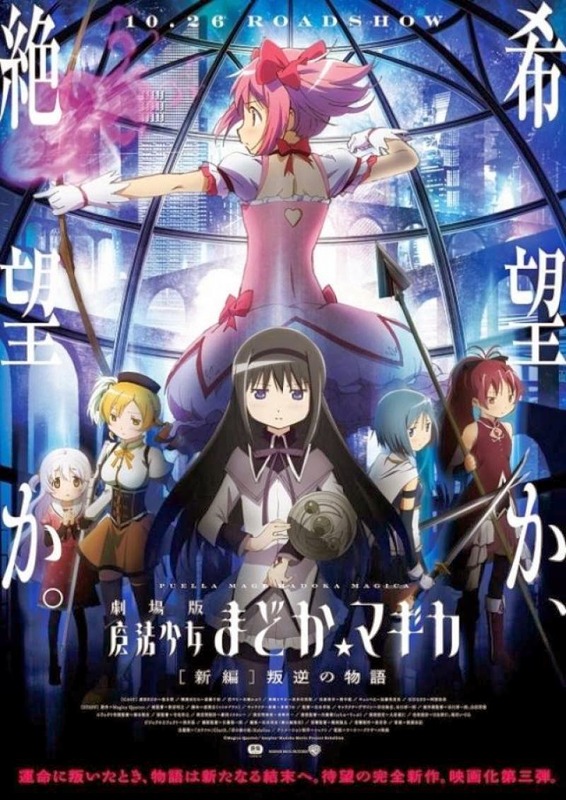 It should be quickly noted that the original ending was actually Homura ascending with Madoka, but it was altered before the film came out due to the company pulling rank. That’s too bad because that ending would have been perfect. It even felt like the film could have ended there so there was definitely some behind the scenes action going. The extra content isn’t bad per say, but this ending would have been superior! Overall, Rebellion was a fun movie and it was still really great. I wasn’t crazy about the ending, but it was a very thought provoking film like I expected and the characters were still all likable like in the show. The soundtrack and animation are strong and the film was around 2 hours so it had quite a lot of time to develop. The Mami vs Homura scene is the one to look out for and the film nearly ends at one point, which was a great fake out. It’s also slightly regrettable though since that ending would have been vastly superior to the true one that we got. If you enjoyed the TV show, then you should definitely enjoy this film and it’s cool to see the main characters finally get to fight as a team for a change since they all got to be alive in the fake world. I do hope that the film gets a sequel at some point so that we can have a more positive ending for the heroes. Particularly for Homura since she’s still my favorite character in the series so I’m hoping that she’ll see the light and realize how far she has come from being the noble hero that she used to be. I’m confident that she would become a hero again in the next film. While her new personality is still pretty epic as the villain, it’s just not the ending that I had envisioned for her. Madoka has always been a layered show and Homura’s final actions are much deeper than your average villain’s. I don’t believe for a second that she should not be considered as a villain by the end because her wish was selfish and altering someone’s memories is always immoral, but at least it’s a decision that I can understand. The whole concept of helping someone through whatever means possible is always an intriguing one and something that I can sometimes agree with. It’s a concept that I’ll probably try to discuss more in a future review that deals with the subject. It shouldn’t be too long until something has this theme again since it can be quite prevalent at times. Almost forgot, make sure that you stick around for the after credits scene. It is fairly vague, but you get to decide what just happened. I like to think that someone is protecting the world from Kyubey and doing it in a way that Madoka would object to, which will raise some tension for the next film.